This was agreed with Tandridge District Council on 22 March 2002. 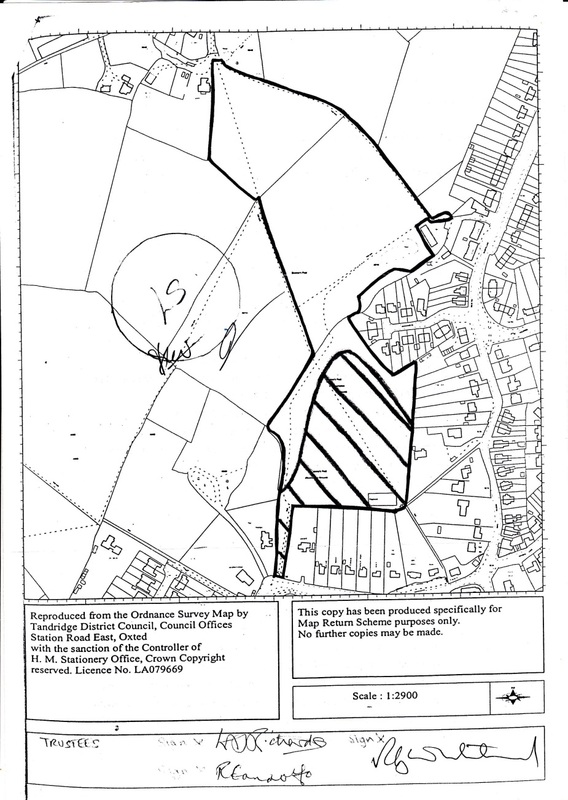 The Community Wildlife Area at Bloomer's and Jenner's Fields, Lingfield, from now on referred to as Lingfield Wildlife Area or LWA, comprises the land shaded green on the attached map [the same as is shown here] and wholly owned by Tandridge District Council, from now on referred to as the Council. The Management Committee for Lingfield Wildlife Area exercises executive powers in maintaining and managing the land, under this agreement. No action of the Management Committee shall prejudice the Council's ownership or ultimate management of the area, or that of any succeeding local authority. 1. In the exercise of its powers, its actions do not prejudice the safety of users of this land. 2. All necessary barriers and notices are erected around works where public protection is thought necessary. 3. All work is done in a workmanlike way, following accepted conservation management principles and practices and as stipulated in the appendix to this agreement. 4. Any damage caused by LWA in maintaining the land is made safe immediately, and repaired to the satisfaction of the Council at the earliest opportunity. 5. All debris and rubbish is cleared away. 6. Burning or burying rubbish (which excludes arisings from work) on site is done only with the approval of the Council. 7. Operatives behave responsibly while working on the site. 8. Public access is not denied or impeded unless previously approved by the Council. 9. Smoke, dust, vegetation or chippings arising from managing the land do not create a nuisance. 10. There is no unreasonable noise and inessential vehicular movement arising from managing the land. 11. The written permission of the Council will be gained before any work or action is begun or carried out that will cause a significant change to the biodiversity of or types of habitat on the site. 1. Require risk assessments, safety precautions or the specific timing of operations if that is within the interests of the well-being of the site or the public. 2. Change or refuse certain works proposed by the Management Committee if doing so is within the interests of the well-being of the site or the public. 3. End this agreement with immediate effect if it considers the Management Committee to be undertaking anything harmful to the site or causing a nuisance. 1. The Council will deal with boundary or other disputes with neighbouring landowners or occupiers. 2. The Council will keep public liability insurance, in addition to the cover held by LWA, on condition that the Management Committee undertake works according to the principles set out in this agreement and according to its constitution as agreed on 21 March 2002. LWA shall be responsible for maintaining all the grassed areas in the Wildlife Area. 1. LWA shall be responsible for maintaining only those trees that LWA planted within or on the boundaries of the Wildlife Area. 2. LWA shall tell the Council of any agreed maintenance work needed to or the complete or partial removal of the mature trees that existed when LWA was set up. The Council will arrange for the work to be done and paid for. 2. Remove from the site or burn all arisings from this and other work on the hedges, except where agreed with the Council. 2. Remove all gathered silt where it is liable to cause blocking of the ditch running from Centenary Gate to the boundary with the Scout Hall, excepting that part of the ditch that runs through the gardens of houses backing on to Haywardens. 3. Remove any debris blocking the flow of water in that ditch. LWA shall be responsible for maintaining the pond and associated wetland in Bloomer's Field. LWA shall ensure that all paths are safe, without potholes or slippery surfaces that may cause a hazard to users.